Case Study: Delivering Emergency Medical Supplies in Sendai｜Implementation Case Study｜SENSYN ROBOTICS, Inc. This proof-of-concept was conducted to confirm the usefulness of drones in delivering emergency medical supplies under the assumption that medical supplies cannot be delivered by road as the road network is cut off by collapsed bridges and other debris when disaster strikes. Is it possible to remotely control the drone using LTE service and land it safely and precisely at its destination? Is it possible to remotely perform the personal verification required when handing over the medical supplies? Is it possible to guarantee the shock-absorbing properties and heat retention of medical supplies mounted on drones against vibration, shock and tilting? This proof-of-concept is conducted by flying the drone to-and-fro between Miyagihirose Sports Complex and the Hirosegawa Nakagawa grounds next to Nishi Sendai Hospital who cooperated with us in this effort. After loading the drone with the requested medical supplies for delivery, the drone is transported by car to Miyagihirose Sports Complex, which is the farthest point accessible by vehicles. 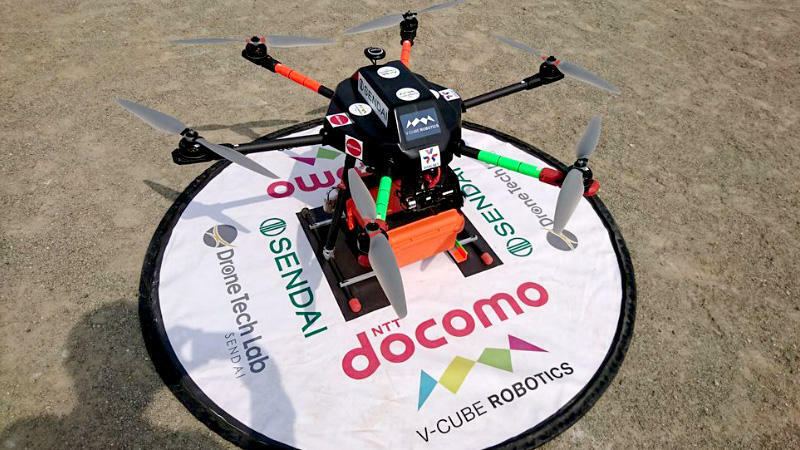 Then, the drone delivered the medical supplies to the Nakagawa grounds next to Nishi Sendai Hospital and returned to the departure point after completing the hand over. Drone flight is a non-visual and automated flight using prescribed flight route. The flight is remotely controlled via LTE service. Safety during the flight is confirmed at all time through real time video transmission system. Confirmation on whether or not medical supplies are received by medical staff is also performed. We were able to confirm that it is possible to deliver medical supplies with proper communications between the deliverer and receiver.